The traditional Mikhail Chigorin Memorial has come to an end on October 26th in the Russian city of Saint Petersburg. Serbian GM Ivan Ivanisevic has become the winner after having taken the sole lead in round 7 - his two draws in the last rounds proved to be enough. Ivanisevic's final result is 7.5/9. Out of the top 14 games, 13 have been drawn in the 9th round, although some of them were tense fights. As a result, GM Ivan Bukavshin of Russia got the 2nd place with the same score as the winner by his inferior Buchholz. The 3rd place went to GM Maxim Rodstein (Israel) who had the best Buchholz among the large 7-points group. Bukavshin managed to catch up with the leader due to his important victory in round 8. 36.Qf6+! Positional ideas might be at least as beautiful as tactical ones. By the queens' exchange, White avoids any complications and builds an ideal blockade in an endgame. Nimtzovich would be happy. 36...Qxf6 37.gxf6+ Kxf6 38.Nxa5 (grabbing a pawn is an important detail) 38...Rc8 39.Nc4 Bc7 40.Kg2 Ke6 41.f4 f6 42.Nb2! (beginning the final regroupment) 42...Kd6 43.Kf3 Rh8 44.Bc4 Rh2 45.Nd3. Black is absolutely helpless despite his extra exchange. 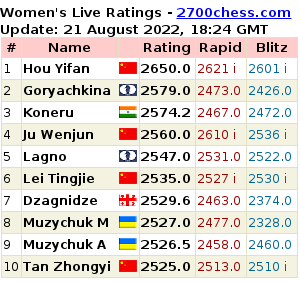 Below you can find all games by Ivanisevic and Bukavshin from the Chigorin Memorial. The traditional Mikhail Chigorin Memorial has taken its start in the Russian city of Saint Petersburg on Saturday. The 9-rounds open Swiss has brought 368 players together. Тhe traditional tournament in memory of Mikhail Chigorin is underway in the Russian city of Saint Petersburg. Seven rounds out of 9 are over now. The traditional Mikhail Chigorin Memorial is taking place in Saint Petersburg. 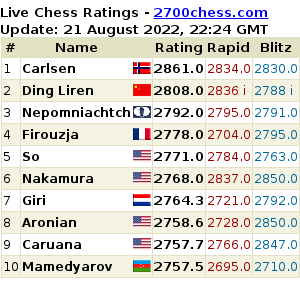 Each autumn, the northern capital of Russia brings together a large number of chess players, including many GMs 2600+ and, sometimes, even 2700+. This year, more than 360 participants are competing in the 9-rounds open. Round 1 of the Poikovsky tournament was marked with only one win: Alexadner Morozevich celebrated win over Viorel Bologan in 96 moves.